Compatible with WHMCS versions 7.4 through 7.7 and PHP versions 5.6, 7.1 & 7.2 in one file set. Automatically import all TLDs available to your eNom account and add them all to your pricing, or manually select those you want to include in your pricing. The module will then automatically manage your domain name pricing across all price slabs & currencies. Set the hour of the day when you want the downloads and automatic updates to take place. This new flexibility allows you to ensure your prices have been updated before the WHMCS daily Cron runs and invoices are issued. You can set the frequency and the day on which you want to download all eNom TLDs again so you can ensure you always have the latest available. You can set the profit margin, price fraction, price rounding (None, Auto, Up or Down), minimum price and multi-year discounts, which are all taken into account when calculating your domain pricing in your local currencie(s) and easily manage Domain Addons, Autoreg and Grace Period settings, either individually or by batch. There is also a Home page widget allowing you to easily check and refill your eNom account balance all without leaving WHMCS. Please ensure you have USD set up as a currency in WHMCS. This is required for the conversion rate used to calculate pricing in local currency from the eNom wholesale pricing, which is in USD. The WHMCS eNom Domain Pricing Manager is designed to operate in fully automatic mode, downloading eNom wholesale prices and updating local domain pricing each day at the time selected when the WHMCS CRON runs. It also has a manual pricing function whereby you can adjust local pricing directly. In the 'Quick Actions' settings you can select whether you want to include all extensions in the automatic update or limit the auto update to specific extensions. There are two ways to achieve this. List the extensions to include, or those to exclude, whichever list is smallest. There is a 'Force updates at next Cron' checkbox on the 'Quick Actions' page that facilitates the forcing of eNom TLDs, wholesale pricing and the update of local pricing without the need to force the WHMCS Daily Cron via the Cron command. Designed to run fully automatically. 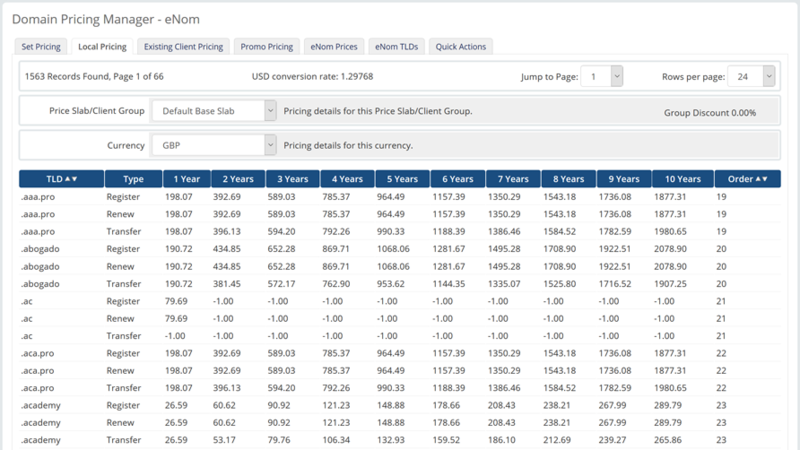 Automatically calculates multi-year term pricing based on the eNom settings for the TLD. Most are 10 years, some, e.g. .co are 5 and others, e.g. .be, 1 year only. Automatically disables transfer term pricing for TLDs where transfer in is not supported by eNom e.g. .ac, .am, .at. 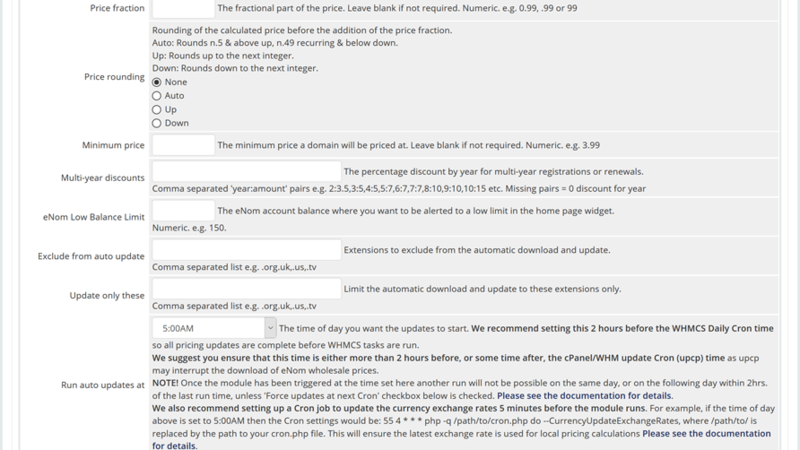 With an time set in 'Run auto updates at', when the WHMCS Cron runs the module will get the eNom wholesale prices for all domain extensions set up in WHMCS. If the module is newly installed the download will occur the first time the WHMCS Cron runs irrespective of the time set in 'Run auto updates at'. Set it and leave it. All pricing is automatically calculated according currency exchange rates and pricing settings. With 'eNom pricing auto update' set, when the WHMCS Cron runs the module will get the eNom wholesale prices for all domain extensions set up in WHMCS. With 'Domain pricing auto update' set all domain pricing across all client groups/price slabs and currencies set up in WHMCS will be automatically updated. There are various settings with which you can control whether the renewal pricing for existing clients is automatically updated or not and whether the updates are limited to domains with 'Auto Registration' set to eNom. You can specify domain extensions to exclude from the auto update, or, limit the auto update to specified extensions. The final sale prices are determined via settings controlling the profit margin, price rounding, price fraction, minimum price and any multi-year discounts set. Final 'recurring' prices for existing clients also take into account any addons (DNS Management, Email Forwarding & ID Protection) purchased as part of the original order. Automatic update has been tested using a list of 521 domains and has been found to take approximately 2 hours with no effect on server load. From the 'Quick Actions' tab you can manually update local pricing, based on the last downloaded eNom wholesale prices, across all client groups/price slabs and currencies set up in WHMCS, either for all domains or limited to a specified list. Updating all local pricing takes approximately 1.5 minutes. Also from the 'Quick Actions' tab, you can get the latest eNom wholesale price and update local pricing for the extension(s) specified, again across all client groups/price slabs and currencies set up in WHMCS. This is limited to 10 extensions in order to avoid timeouts. Updating 10 domains will take approximately 2 minutes 30 seconds. From the 'Set Pricing' tab you can quickly and easily set, update or remove registration, transfer and renewal pricing for terms up to 10 years across any price categories, client groups/price slabs and currencies for domain extensions you have set up in WHMCS. You can choose to manually set the price for each term, or set the '1 Year' price and get the module to calculate pricing for the other terms automatically. You can set/update pricing in each price category individually, or across all three price categories at the same time with the same pricing, as required. When 'Update renewal pricing for existing clients' is selected, renewal pricing is automatically calculated taking into account the registration period and any addons (DNS Management, Email Forwarding & ID Protection) purchased as part of the original order. Price: GBP 3.80/month or 38.00/year. I have deployed this module on several client accounts. It is simple, straight forward and well documented. DO NOT DELAY! BUY IT TODAY!!! I cannot recommend this module enough. We had been using the severely broken eNom Pro for years, and our domain pricing was well and truly messed up, with no response from eNom Pro support. When they finally abandoned the project entirely, we started looking for alternatives. This was exactly what we were looking for - completely automated, easy to use, and with all the options and settings we needed plus more. We installed it on two separate WHMCS installations, both of which were highly customized and frequently caused problems with new addon modules or installations. Due to these customizations, we had different problems with this module on both installations - but there was no need to worry. Customer support is phenomenal. Quick, detailed, and patient, with extensive understanding of their product and code. Les worked with me through every issue we ran into, answered my numerous questions, and provided exact and specific support throughout the process. We now have two working installations of this module set up exactly how we wanted and none of our clients were negatively affected during the troubleshooting. Current eNom Pro users should swtich to this module as soon as possible - the difference is night and day. 5 stars - 10 if I could - all around, for both the module itself and the absolutely stellar support. Thank you, Nerdle! We would like to echo all the feedback already provided by others. Having despaired with OpenSRS's failure to update their code (for PHP7+ and WHMCS 7.+ support) and now their disappointing change in pricing model, we opted for ENOM. This is a fairly daunting task due to setup and maintenance. However, this module has made light work of this and enabled a far better solution than OpenSRS ever provided. It was well worth the move. The support provided is something to be cherished. So often support is lacking in products but that is totally not true here. The team were quick to respond and the answers were thorough. It is clear that the owner/team understands their products and sets a high bar at ensuring a great customer experience. SaneChoice have absolutely no hesitation in recommending the ENOM plugin and we will continue to use them for the foreseeable future. The technical support provided by the author of this product is simply amazing; he goes above and beyond for you. The author provided critical updates for my site within a matter of hours, which is simply outstanding when you consider how much you are paying for this addon relative to some others. Overall, I'm very happy with this product and its feature-set. We have been running this module for a while now, and are very pleased with it. Highly recommended to keep your ENOM pricing and prices in order. Their support is really good and is also quick which means so much in this industry. Purchased this module yesterday as we changed domain providers to enom. All I can say is this module is great at syncing prices and works well. Support has been very quick, very helpful and polite. I look forward to seeing more from these guys. This module is a MUST for anyone running eNom with their WHMCS. Other similar modules that we have tried just do not work correctly and do not have the large range of features that this module has. We are using this module on two of our websites which sell in GBP (It works with all currencies setup in your WHMCS). As eNom prices change from time to time and are in USD, we needed a solution that would adjust pricing based on those changes and, crucially, the exchange rate whilst also adding an adjustable profit margin percentage onto the wholesale pricing. All that is done flawlessly and, because it runs as a cron when obtaining the current pricing from eNom, it does not suffer from timeouts and can obtain and update all the pricing for 500+ domains in around 2 hours, all without any manual work! We have been monitoring the load on the server while this module is running and it is negligible. An excellent feature which again works flawlessly is that, if enabled, it will also go and update your existing customer's domain renewal pricing including accounting for things like ID Protect pricing etc again all without any manual work involved! Excellent and is exactly the functionality that many of us were crying out for but nobody could deliver until now! The link to the WHMCS Daily Cron has been replaced by a solution whereby the user can choose the hour in which they want the module to run. Add 'Force updates at next Cron' to enable forcing of the module to run at the next WHMCS Cron time without the need to force the WHMCS Daily Cron via the Cron command. Add 'Enable debug mode' to the Quick Actions tab. Add 'Last ran' and 'Next run' indications in the sidebar. Implement checks on PHP directives (allow_url_fopen & max_input_vars) that affect module performance and indicate current and required settings if changes are required. Implement checks on requirements and settings key to module operation and provide notifications containing information and the required course of action. Fix a small bug preventing the display of the 'New Version' message. Small code & CSS changes to improve the display of settings error messages. Change to the update pricing logic in order to correctly update the renewal pricing for existing clients for domains offered as a free domain with the purchase of another product where the domain would continue to be renewed free as long as the product it was offered with is renewed. CSS changes to improve the formatting of the TLDs table on eNom the TLDs page with various zoom settings on different browsers. Changes to the text on the Quick Actions page to clarify the purpose and use of the two pricing update sections. Renamed some tabs to improve available space for future developments. Fix a small bug resulting in the Email Fwd. addon pricing being displayed in the ID Prot. column. This bug affected the price display only and not the actual calculated pricing. A small bug fix affecting the correct display of TLD addons settings. Compatibility with WHMCS versions 7.4.x & 7.5.x and PHP version 5.6, 7.1 & 7.2. Code changes to mitigate against what appears to be a Cron timing issue intermittently interfering with the license check. Some small text changes regarding the eNom Low Balance Limit on the module configuration and Quick Actions pages. Compatibility with WHMCS versions 7.4 & 7.5 and PHP version 5.6 & 7.1. Grace period, redemption grace period and fees sections added to the TLDs selection page. Fixed a bug resulting in an incomplete set of module log entries when debug is on. Updated text on the module configuration, Quick Actions and eNom TLDs pages. Moved the eNom TLDs download from a manual action within the module to a fully automated function running when the WHMCS daily CRON runs with timing controlled from within the module configuration. Remodelled the 'eNom TLDs' page to reflect the change, added an indication regarding the last time all TLDs were downloaded & updated the documentation. Updated the code to improve speed when adding/removing TLDs from those offered for sale. Fixed a bug where the table sort image was not appearing in the column heading. Fixed a bug where the eNom logo was not appearing in the refill widget refill popup. Introduced a timeout in the home page widget to prevent delays should the eNom API be unavailable. Working comfortably with ResellerClub's products and services through your WHMCS system requires additional tools. This module will integrate WHMCS with Dropbox to upload a copy of WHMCS database onto the cloud. You will never have to worry about losing data any more.